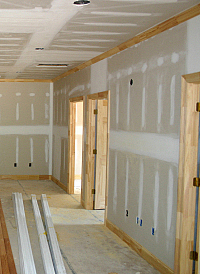 Trim work is begun immediately after completion of drywall. 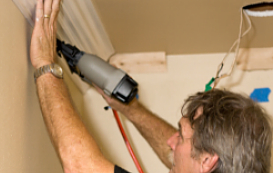 Depending on the size of the house and complexity of the work, the entire job can take anywhere from three days to two weeks or more. 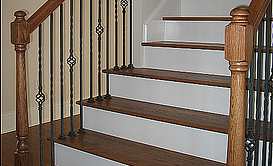 ● Build stairs, installing treads, handrails, pickets, trim boards. He works from the rough-in stairs built by the framer. The use of crown mold is optional. 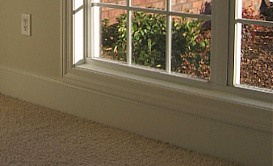 I install it in the master bedroom and bath, family and living rooms, dining room, foyer, and kitchen. Closets never get crown mold. Small bedrooms and baths don’t get it unless the home buyer asks for it.